(Nanowerk News) The most likely source of the water locked inside soils on the moon's surface is the constant stream of charged particles from the sun known as the solar wind, a University of Michigan researcher and his colleagues have concluded. Over the last five years, spacecraft observations and new lab measurements of Apollo lunar samples have overturned the long-held belief that the moon is bone-dry. In 2009, NASA's Lunar Crater Observation and Sensing satellite, known as LCROSS, slammed into a permanently shadowed lunar crater and ejected a plume of material that was surprisingly rich in water ice. Water and related compounds have also been detected in the lunar regolith, the layer of fine powder and rock fragments that coats the lunar surface. But the origin of lunar surface water has remained unclear. Is it mainly the result of impacts from water-bearing comets and other chunks of space debris, or could there be other sources? Theoretical models of lunar water stability dating to the late 1970s suggest that hydrogen ions (protons) from the solar wind can combine with oxygen on the moon's surface to form water and related compounds called hydroxyls, which consist of one atom of hydrogen and one of oxygen and are known as OH. In an article published online Sunday in the journal Nature Geoscience, U-M's Youxue Zhang and colleagues from the University of Tennessee and the California Institute of Technology present findings that support solar-wind production of water ice on the moon. The first author of the paper is Yang Liu of U-T. She is a U-M alumna who earned her doctorate under Zhang, who is a professor in the Department of Earth and Environmental Sciences. 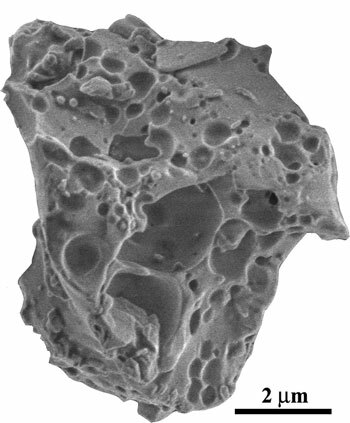 In the paper, the researchers present infrared spectroscopy and mass spectrometry analyses of Apollo samples that reveal the presence of significant amounts of hydroxyl inside glasses formed in the lunar regolith by micrometeorite impacts. When combined, the techniques of Fourier transform infrared spectroscopy and secondary ion mass spectrometry can be used to determine the chemical form of the hydrogen in a substance, as well as its abundance and its isotopic composition. Most of the infrared spectroscopy work was done at Zhang's U-M lab, and the mass spectroscopy was conducted at Caltech. "We found that the 'water' component, the hydroxyl, in the lunar regolith is mostly from solar wind implantation of protons, which locally combined with oxygen to form hydroxyls that moved into the interior of glasses by impact melting," said Zhang, the James R. O'Neil Collegiate Professor of Geological Sciences. "Lunar regolith is everywhere on the lunar surface, and glasses make up about half of lunar regolith. So our work shows that the 'water' component, the hydroxyl, is widespread in lunar materials, although not in the form of ice or liquid water that can easily be used in a future manned lunar base." The findings imply that ice inside permanently shadowed polar craters on the moon, sometimes called cold traps, could contain hydrogen atoms ultimately derived from the solar wind, the researchers report. "This also means that water likely exists on Mercury and on asteroids such as Vesta or Eros further within our solar system," Liu said. "These planetary bodies have very different environments, but all have the potential to produce water." The regolith glasses are called agglutinates, and the study reported in Nature Geoscience is the first to identify agglutinates as a new reservoir of OH on the moon?an "unanticipated, abundant reservoir" of OH and water in the lunar regolith, according to the authors. The researchers analyzed individual grains from Apollo 11 mare soil, Apollo 16 highland soil and Apollo 17 mare soil. The grains included agglutinates and impact glasses. In addition to Liu and Zhang, authors of the Nature Geoscience report are Yunbin Guan, George Rossman and John Eiler of Caltech and Lawrence Taylor of U-T. The work was funded in part by NASA cosmochemistry grants to Taylor and Zhang, by support from the Moore Foundation to the Caltech Microanalysis Center, and by a National Science Foundation grant to Rossman. A portion of the study was also supported by U-T's the Planetary Geosciences Institute.